In Everyday Thai Cooking, Katie Chin, a chef hailed as the ‘Asian Rachel Ray’ by her many fans, shares her recipe secrets along with tips, tools, and techniques that enable you to easily bring delectable homemade Thai dishes to your table! As the daughter of award-winning restaurateur Leeann Chin, Katie’s heritage has been deeply rooted in the cultivation of fine Asian cuisine. Katie has since taken the culinary world by storm as a well-respected food writer, television personality, and now published author. Katie is a success among the cooking community, however, her true reward stems from her success at home. 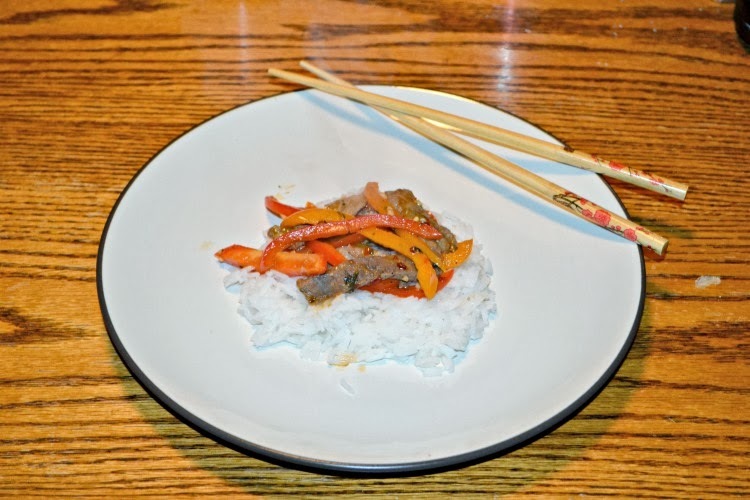 As working mother of toddler twins, Katie realized a need for simple, easy and delicious Thai recipes that call for accessible ingredients and Everyday Thai Cooking delivers just that. I read a lot of cookbooks but I have to say I loved this one instantly! From the big, beautiful photos to the incredible recipes, I was sold on this cookbook from the beginning. In fact, I immediately wrote down 9 recipes I wanted to make in the next month. 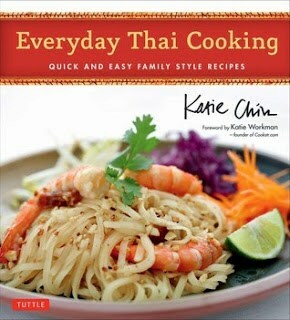 The beginning of the book has a great section for people new to Thai cooking. 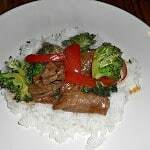 There is a section on basic cooking techniques, basic tools and utensils, understanding Thai ingredients, and the basic sauces and pastes used in cooking. 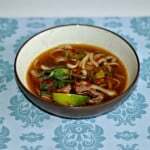 I found the recipes for the basics, such as ginger lime dipping sauce and Hoisin peanut sauce, to be so versatile that I can use them with so many different dishes! The cookbook is divided into sections according to meal types: appetizers, soups, salads, poultry, beef, seafood, noodles and rice, vegetables and tofu, and desserts. I was very excited about the tofu section as I basically rotate the same 4 tofu recipes and there are so many ideas in this one. So far I have made three recipes, the one I am sharing today along with the Green Beans and Tofu and Thai Iced Tea. 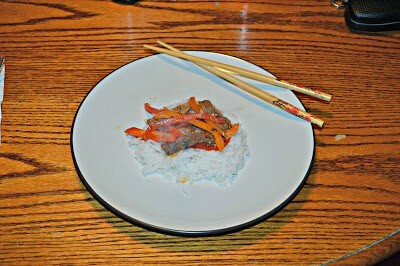 The Beef with red Chili Paste is spicy but slightly sweet with a citrus finish. It’s really delightful over top of rice. 1. Toss the beef with the cornstarch, pepper, 1 teaspoon of oil, and soy sauce. Cover for 10 minutes at room temperature. 2. Heat 1/2 of the oil in a wok or skillet over medium high heat. Add the beef and stir-fry until it’s brown, about 3 minutes. Remove the beef from the pan and set aside. Wash and thoroughly dry the wok or skillet. 3. Heat the remaining oil in the wok or skillet over medium-high heat. Add the garlic, shallots, and chili to the wok or skillet and stir-fry until fragrant, about 1 minute. Add the red pepper and stir-fry for 1 minute. Add the reserved beef, lime juice, fish sauce, roasted red chili paste, kaffir lime leaves, and brown sugar. 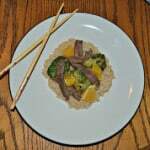 Stir-fry for 1-2 minutes or until the beef is cooked through. Add the basil leaves and stir-fry for about 30 seconds or until wilted. 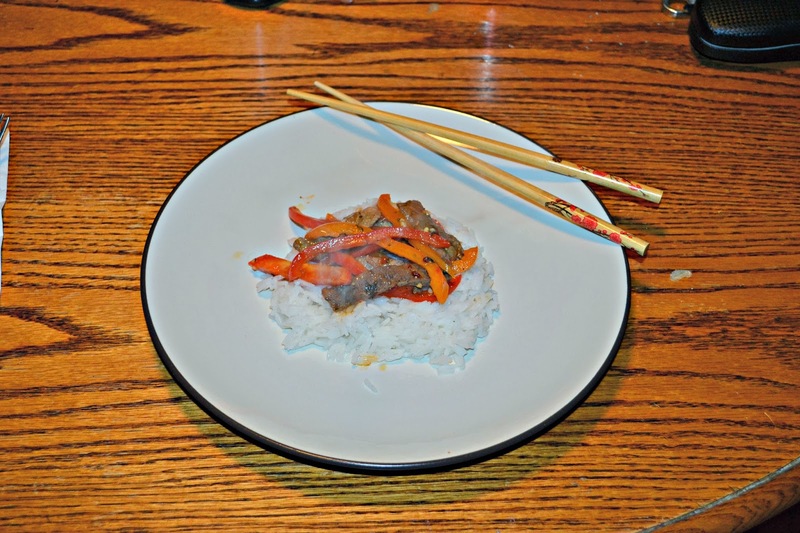 Dish out and serve immediately with jasmine rice. I love love love Thai food! I would love to make this. so enjoy Thai food. 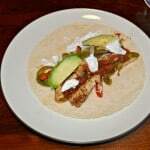 don’t often make it but I will give these recipes a try. The book looks fab too! I just made Thai Red Curry with Chicken 2 nights ago – I can eat Thai food every day – maybe my past life was spent in Thailand! !